Robust, deep body. Single dorsal fin. Sharply rounded snout, moderate sized mouth which reaches back to level with the rear of the eye. Moderate sized eye situated high on the side of the head. Upper jaw is longer than the lower jaw, both jaws have well developed teeth. Large scales on the body. Prominent lateral line. Gold-brown to bronze, with greenish iridescence on the back and sides. Head is darker, often brown-blue to brown-purple. Underside, including chin, is usually creamy white. Fins are dusky brown. Common in all coastal drainages. Strictly an estuarine and freshwater fish, rarely found in the sea. Occurs in a variety of habitats: in estuaries over sand-gravel bottoms, soft mud flats and in weedy areas, the lower reaches of large rivers, and in coastal lakes. Can reach 60 cm and 4 kg, although commonly smaller. Black bream become sexually mature at 3-4 years of age. Available data indicates that it takes approximately 9 years for bream to reach the legal minimum length of 28 cm. Spawning season is between August and January, occurring first in eastern Victoria then progressively to the west. Salinities of 11,000 to 18,000 p.p.m. are required for spawning to occur. Mature females can produce between 1-3 million eggs which are very small and hatch in about 2 days. Omnivorous, feeding on shellfish, worms, crustaceans, small fish and plant material including algae. Rarely found at sea, although some limited movement between estuaries appears to occur. 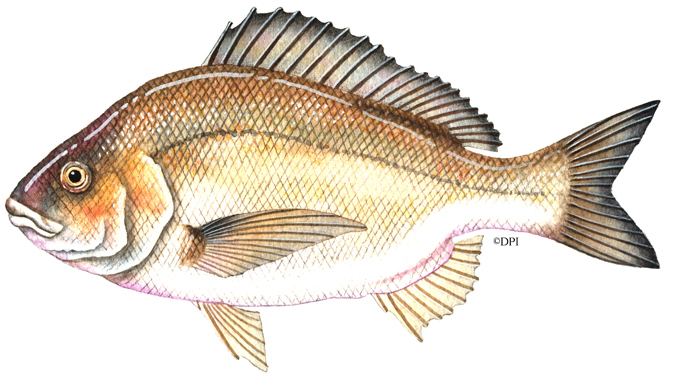 An important recreational and commercial species and a tasty food fish. Recreational Fishing Licence requirements, and the regulations affecting the taking of black bream in Victoria, are provided in the Victorian Recreational Fishing Guide, available free from RFL sales agents and DEDJTR Offices and Information Centres.